Embrace Psychology is run by Dr Claire Whitten and Dr Georgina Batten. We are both Clinical Psychologists with over 14 years collective experience working in child and adolescent mental health services in the NHS. As clinicians we are passionate about the pivotal role parents can play in developing positive mental health in their children alongside the importance of prevention and early intervention. We feel that parents are not given support early enough and we aim to bridge this gap by providing accessible, timely and affordable help. We have both worked with children and teenagers with a range of emotional difficulties including depression, anxiety disorders, complex trauma and self-harm. Much of our experience has included young people with additional difficulties such as Autism Spectrum Disorders and learning difficulties. We are trained in therapeutic models such as Cognitive Behavioural Therapy, Narrative Therapy, Systemic Therapy, Mindfulness and Compassion-focused Therapy. 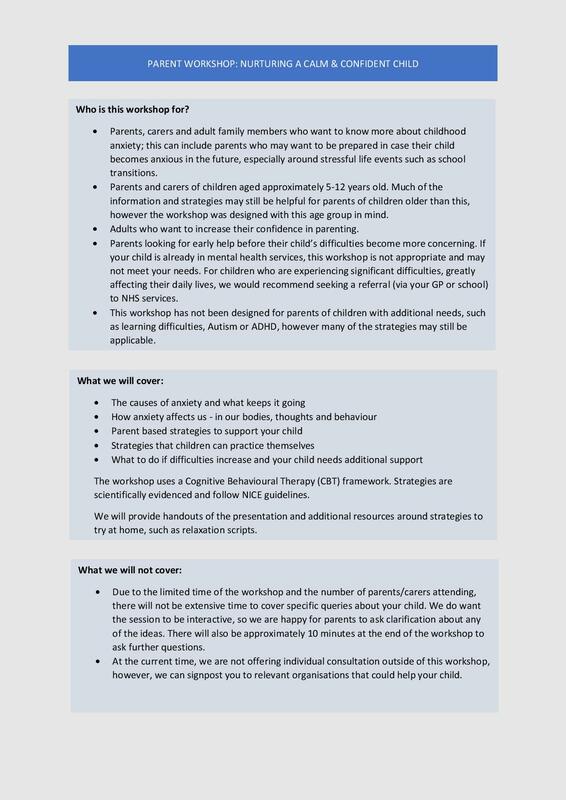 Our workshops for parents and carers focus on specific topics related to child development and child mental health. They aim to improve parents’ understanding of potential childhood difficulties and empower them with a range of strategies that they and their child can use. The workshops are targeted at families who are not currently accessing child and adolescent mental health services as they are designed with early intervention in mind. Parents are informed how to access further help if needed. The information and strategies provided are supported by scientific evidence and follow guidelines from the National Institute for Health and Care Excellence (NICE). 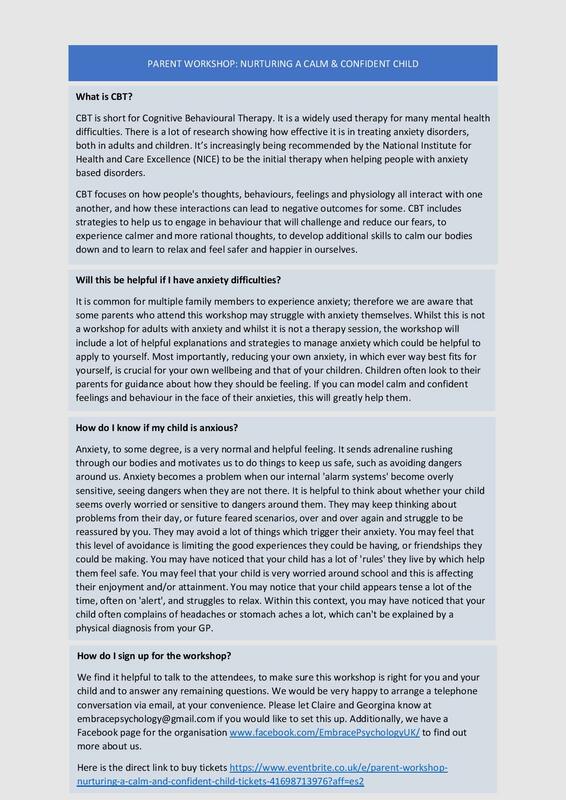 We are aware that it can be difficult for parents to know how to respond to their child’s difficulties and that they may feel de-skilled and worried about the future. We hope that Embrace Psychology can empower them with advice, support and confidence to nurture calm, happy and resilient children. 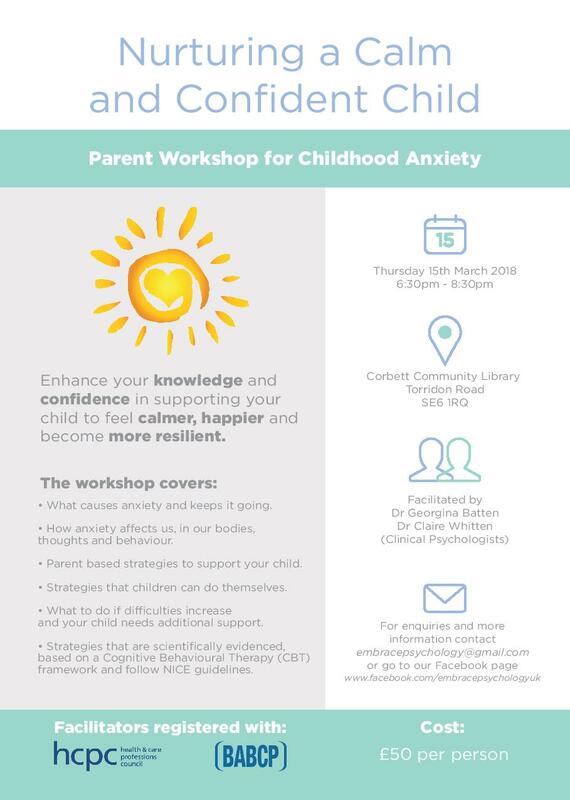 Nurturing a Calm and Confident Child- A Parent Workshop for Childhood Anxiety. Next post NEWS: Lewisham Borough Police to merge with Greenwich & Bexley!